36 cm tall (14 inches). 28 cm wingspan. Base = 14 x 12 cm. 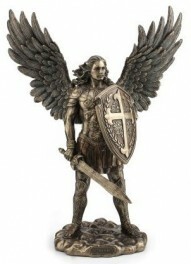 Cold cast solid bronze resin guardian angel warrior. Field commander of the Army of God; Sword and shield ready to cast down the darkness. Weighty and impressive display piece. Micheal means Who is like God.